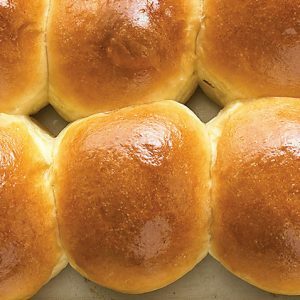 These buns are easy to make and are very tasty. They complete any meal. Combine 2 c flour, water, margarine, sugar, salt, and egg. Mix well and add the yeast. Gradually knead in remaining flour. Grease a bowl and place dough in turning once. Cover with wax paper and a towel. Rise, punch, rise, punch, shape, and rise. Bake in preheated oven for 15 min.